Downtown Chattanooga is visible from Point Park on Sunday, April 16, 2017. Downtown businesses and homes generated more property taxes last year than any area in Chattanooga, rising by nearly 39 percent in the past five years. 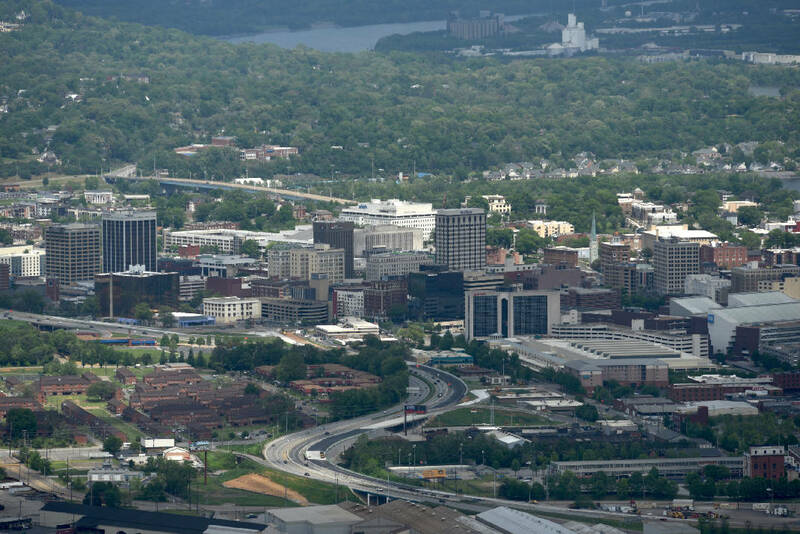 A new study on the geographic source of city and county property tax collections found that the urban core of Chattanooga produced $17.6 million of property tax revenues within its 510-acre area downtown, or nearly 36 percent more than what came from the region's biggest suburban commercial area around Hamilton Place mall in East Brainerd, which is nearly three times as big. In the broader area of downtown served by the River City Co., from the North Shore to Interstate 24 and from the Tennessee River to Central Avenue, downtown properties paid $44.5 million in taxes to city and county governments last year. Even with tax breaks for some new developments and growth in non-taxed facilities at UTC, TVA and local governments, the central city is still by far the top area for generating local property taxes. With just 0.1 percent of all land in Hamilton County, downtown produces 4.5 percent of all property tax revenues in the county, according to a new economic analysis prepared for River City Co. by the Metro Ideas Project. River City Co., which commissioned Metro Ideas Project to undertake the study, said the tax collections underscore the value of public investments and tax incentives used downtown. "When you look at the 38 percent growth in property tax payments in the past five years, including a $4.9 million increase just last year, I think it shows the value of the local investments downtown and how those investments are paying off for everyone in our community," said Kim White, president of the River City Co. "A healthy downtown is good for every part of our county." Downtown Chattanooga has attracted more than $1 billion of new and expanded business investment in the past three years, some of which is still being built. River City Co., helped grant tax breaks for five apartment complexes added in recent years — the Maclellan Building on Broad Street, Market City Center in the 700 block of Market Street, a 174-unit apartment complex being built at 2108 Chestnut Street, a Walk to Campus complex on Lindsey Street and Passenger Plats at the Chattanooga Choo Choo. All of those apartment projects qualified for payment in lieu of taxes (PILOT) agreements, allowing them to pay only the school portion of their property tax bill for five to 15 years. Ultimately, the apartments will be fully taxed. Other downtown building projects at the University of Tennessee at Chattanooga, Erlanger hospital, the Tennessee Valley Authority and Miller Park are not taxed because they are owned by government or non-profit agencies. The tax breaks for privately owned residential projects, including previous agreements to give tax breaks for projects such as Walnut Commons apartments and the BlueCross BlueShield of Tennessee corporate headquarters, have been criticized by some as corporate welfare and for encouraging development that threatens to crowd out lower-income residents who no longer can afford to live in the increasingly trendy downtown. Helen Burns Sharp, founder of Accountability for Taxpayer Money (ACT) in Chattanooga, has urged city leaders "to be more cautious" in granting tax breaks for private developers since nearly 30 percent of the land in Chattanooga is already exempt to some degree from normal property tax payments because of the property's tax-exempt status or PILOT agreements. But even with such tax breaks, overall tax payments from downtown property owners continues to grow at a faster pace the rest of the county, data shows. Downtown properties pay more than $7.5 million a year in school taxes alone to Hamilton County. "We are often asked after 30 years whether we need to keep investing in downtown and I think this study shows the value of those investments for our community and for local government," said Amy Donahue, director of marketing for River City. "Everyone benefits from our downtown, whether you live, work or play downtown or not." River City did its Central City Plan in 2013 to help plan future development downtown and the central city is on pace to double its urban core population since that date. "We still don't have a lot of our ongoing investment in the central city included in these tax numbers and I expect in the next three years you'll see these tax revenues jump dramatically," White said.